While I understand its not an exact science, I gather that if J award is available using the normal amount of qmiles, one could use qcredits to up from Y to J. Would it be worth calling the call center even though they cannot upgrade over the phone anymore? Has anyone else tried anything else? I have 40 qcredits to burn by April and 60 more by May. If it isn't against the rules of the forum, I'm happy to share them with someone else since it's unlikely i'll be able to use them. Yes it’s unfortunately not an exact science. It might be due to some married segment constraint too... Is your ticket originating from DOH or another city ? 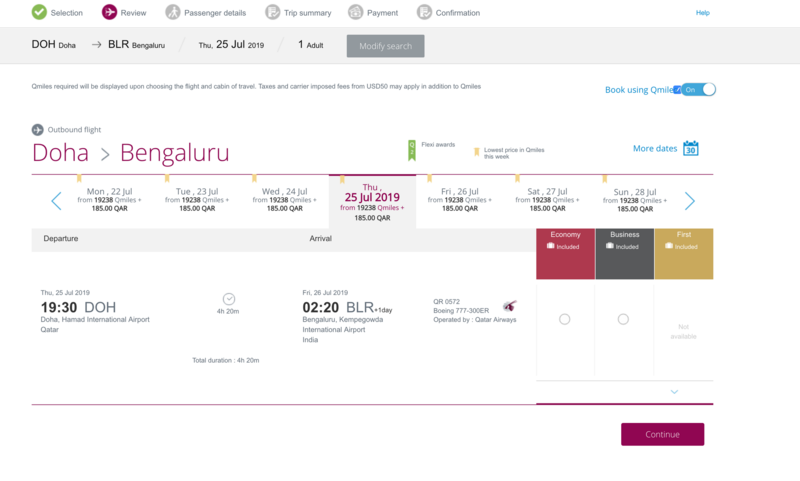 If another city you should check if there’s standard business award availability for the whole trip City-DOH-BLR. If not, that might explain your problem even if you only want to upgrade the DOH-BLR flight. no married segments here -- its a multi-city ticket though DOH-BLR and BOM-DOH. I've emailed qmiles and will report back. How did you check for at least 2 business award seats available? Was it just looking for normal availability on qmiles.com (without the language "X seats remaining")? Last week I had this issue as well just that I wanted to upgrade using Qmiles, not Qcredits. You can read about my experience here - Success story: QR Doha contact centre (Y to J Qmiles upgrade). I found their Doha contact centre staff very helpful and my issue was resolved within 24hours. Emails can take a long time with QR. I suggest calling them. Btw, I assume that you have booked a Y fare that is eligible for an upgrade, correct? How did you check for at least 2 business award seats available? Just make a dummy award booking for 2 people in business class and check if there’s availability at normal (not 2x) Qmiles rate. Glad we were able to help - and thank you for your feedback.